Painted turtles are a favorite of wildlife watchers because they are easy to find. Painted turtles are hardy and can overwinter at the bottoms of lakes, streams and ponds, providing opportunities for educational field trips throughout the temperate climates of the United States. Painted turtle offspring are quite small and easy to take care of, even by young children. Painted turtles named because of their brightly-colored skin, sometimes containing yellow or green stripes. Purchase or request from your local sandwich shop several half-quart plastic containers with lids that are used to store egg salad or potato salad. You should expect to incubate six or seven eggs per container. Use a strong hole punch and place several holes in the top of each container to allow for exchange of gases and water. At your local plant store, purchase vermiculite, and moisten with water until soggy, and then squeeze out the excess liquid. Fill the containers with this combination. You may add store-bought moss to the vermiculite, which can increase its water-holding and clumping properties. Prepare the containers which will incubate the eggs until they hatch. The appropriate substrate is a soil like mixture, but it holds and releases water, as opposed to regular dirt which can harbor fungus and viruses, and can harm the eggs’ development. Look for eggs in soft, sandy soil near bodies of water such as streams, lakes and rivers. You might do best to find your turtle eggs in areas of relative wilderness, but turtles have been reported to lay eggs in the back yards of residential areas. Turtles tend to flatten the areas in which they lay their eggs, but do leave telltale signs like urine deposits over their eggs, and small areas of disrupted soil. Rather than using a trowel to dig out a likely nest of turtle eggs, use a small tool like a spoon and a small brush to carefully uncover the dirt from around your egg. Keep each egg right-side up when transferring it to the container in which it will be incubated. Take a small felt tip maker on your turtle hunt, so that you may mark and keep track of which side is right-side up in your turtle egg. Place filled egg-containers with lightly-sealed lids into the incubator; keep the temperature between 77 and 87 degrees Fahrenheit for 2 1/2months. (Although some painted turtle eggs have been known to overwinter in the ground, eggs generally take 67 to 72 days until hatching, if kept at the proper temperature). 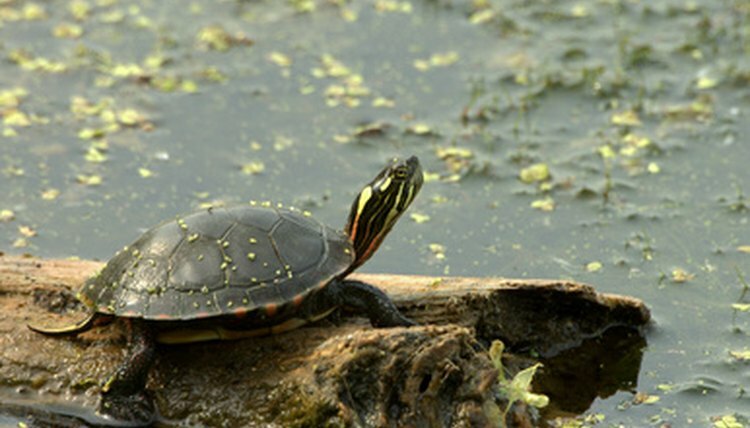 However, some painted turtles may hatch after a month and a half, or less, of incubation. Check your containers often to see if your turtles are hatching, but try to refrain from opening your turtle containers too often, as this can harm them. You can control the majority of the offspring's gender by keeping a close watch on the temperature of your incubator. Males will be produced if the eggs are kept between 82 and 84 degrees Fahrenheit, and females will hatch if eggs are kept at 84 to 86 degrees. A safer way to let turtles hatch is to observe them in the wild. If you happen to see a painted turtle laying eggs in the wild, you can protect the site by securing mesh over the spot with heavy bricks until the scent of the mother has been washed away, thereby leaving the turtles to hatch in peace. Turtle eggs must be harvested carefully, but not in temperatures higher than 80 degrees, or they may perish under the sun. Turtle eggs are protected by state statutes in some areas, so consult your local parks department before you dig up a turtle egg. Eggs found in water generally don’t develop, so leave those submerged turtle eggs where you find them.